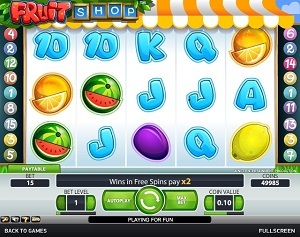 Fruit Shop is a colorful and classic online video slot game from Net Entertainment that has been released on November 2011. This online video slot machine game has 5 reels and 15 fixed pay lines. The theme of Fruit Shop is, obviously, based on the original fruit slots game that has captivated slots players of different walks of life all around the world. In Fruit Shop video slots, Net Entertainment wanted to capture the classic flow and feel of the original fruit slots style and incorporate it with an energetic, upbeat and colorfully trendy style. Fruit Shop is considered to belong to Net Entertainment’s Smart Range™ family of games, which offer record short load times without compromising quality and player experience. Fruit Shop is quite a bit different from classic slots because it has Wild substitutions that reward players with a 2x multiplier for each and every fruity wins. Any matching fruit symbol (except for cherries) winning combinations trigger small yet frequent quantities of Free Spins. All wins gotten from Free Spin games are multiplied by 2x! To add more servings to your fruit platter, players can get additional wins in Free Spins as long as they get the Wild symbol which rewards them a sweet multiplier x4! Net Entertainment is always so munificent when it comes to their online slots games, and allowing interested players to play instantly without having to download anything is one of the many reasons why they are very well-liked by numerous online slots players all over the world. If you were one of those who spent some of their childhood days trying to sell lemonade to earn some pocket money, or you just enjoy eating different fruits such as plums, cherries oranges and watermelons, then for sure you will love playing the Fruit Shop video slot machine game! Take a trip down memory lane with this classic 5-reel, 15-line slot game which has a maximum cash jackpot of $40,000, a maximum coin jackpot of 40,000, a unique Bonus Feature game that awards you with Free Spins (without the need for Scatter symbols), and last but not least, it has a sweet and juicy 96.7% payout ratio! What many online slot players love about Net Entertainment is that it offers state-of-the-art graphics and joyful sounds, which make online slots more fun and enjoyable to spend time with. Fruit Shop is, just as its name implies, a slot game that is full of colorful fruits! The background setting is very simple, with leaves at the outer corners of the reels, and the overall look of the reels makes you think you are actually at a local fruit stand! The symbols are classically drawn (no faces in the actual fruits themselves) and the background of the reels is just white with a bluish shadow (in the Free Spins game, it turns orange); thus, playing with this slot game will definitely not strain your eyes. The overall graphic design of Fruit Shop displays a wide array of colors such as red, orange, green, yellow, blue, brown and purple. There is actually no constant background music you will hear when you are playing the regular Fruit Shop slots game. However, in the Free Spins Bonus Feature game, when you spin the reels, you will hear background music that resembles like someone is in a hurry (when you are used to playing classic arcade games). A short, celebratory music will fill your ears whenever you manage to hit a win! The card deck symbols available in the Fruit Shop online video slot game are 10, J, Q, K and Ace. The regular symbols used in this game are: cherries, lemon, watermelon, orange and plum. The Wild Symbol is the Fruit Shop Logo. The Fruit Shop Logo acts as a substitute for all other symbols in order to help you complete a winning combination and it even multiplies your payout. The Fruit Shop Logo doubles (multiplier x2) the payout of any winning combination that you get, provided that it acts as a substitute symbol. Only one Fruit Shop Logo (Wild symbol) multiplier is applicable in each pay line win. If you win on different pay lines simultaneously, all of them are added up. Take note that pay line wins are paid out only if in succession from leftmost to right. There is no Scatter Symbol in Fruit Shop. Fruit Shop Free Spin Bonus Feature Game – Whenever 3 or more fruit symbols (with the exception of cherries, which pay for 2 symbols) come out along a pay line, you will be given 1, 2 or 5 Free Spins. While you are playing the Free Spins game, any winning combinations with matching symbols gives you another extra Free Spins. When you get winning combinations with the Fruit Shop Logo (Wild symbol) while playing the Free Spins, you will get paid out the Free Spin multiplier value plus the Wild multiplier value! When the Free Spin Bonus Feature game has ended, you will then resume playing the regular Fruit Shop video slot game and your Free Spin game wins are included to your total win balance. While you are in the Free Spins Bonus Feature game, if you manage to get any matching symbols, you will be awarded yet again extra Free Spins!